The VTech CS6859-2 + (3) CS6709 is the cordless phone equipped with DECT 6.0 technology, which delivers excellent sound quality, security and range. The phone features full duplex handset and base speakerphones and intercom between handsets and base unit. The phone has a digital answering system with up to 14 minutes recording time. 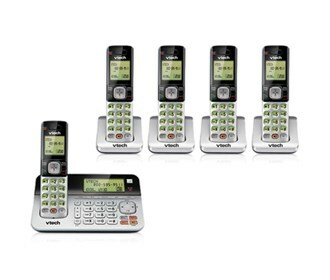 The CS6859-2 + (3) CS6709 is expandable up to 5 handsets with only one phone jack. The phone additionally features caller id, call waiting, 50 name and number phonebook directory, voicemail waiting indicator, redial and any key answer. The VTech CS6859-5 has many exciting features for users of all types. You can extend the lifetime of your VTech CS6859-5 with the purchase of a FactoryOutletStore Factory Protection Plan. See the VTech CS6859-5 gallery images above for more product views. The VTech CS6859-5 is sold as a Brand New Unopened Item.